We spent this week continuing on the never-ending home improvement binge, in which my wife spends thousands of dollars on (admittedly needed) home improvement, and then says "Hey, we're nesting!" when I grumble at the (mumbledy mumbledy) expense of it all. This week it was fixing up the master bathroom closet, which has been built since January, but empty (well, filled with a jerry rigged system of laundry stuff, but nothing permanent, and the Crafty Cat Room, because S has decided that this is the place where she will stockpile her nuclear supply of yarn for her knitting projects. I believe, although I can't be 100% positive, that she is in a knitting arms race with several people on Ravelry. And the de-proliferation treaties are not going well. 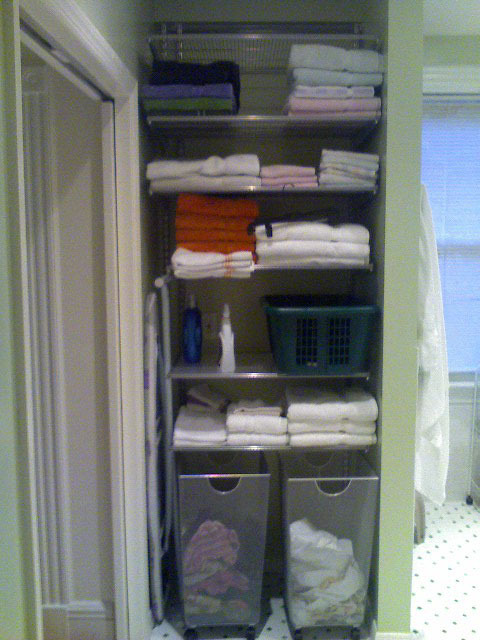 We had california closets (who did a great job in our master walkin closet) quote us the master bath, including doors, but it was approximately 1200, and didn't quite look the way we wanted it. 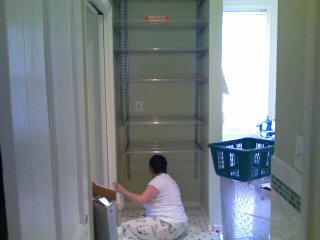 We were able to put the shelves up for approximately $400, and we still have to figure out a door solution, but at least its more to our liking. And we didn't have the $1200 anyway. We were too busy buying expensive dinners! 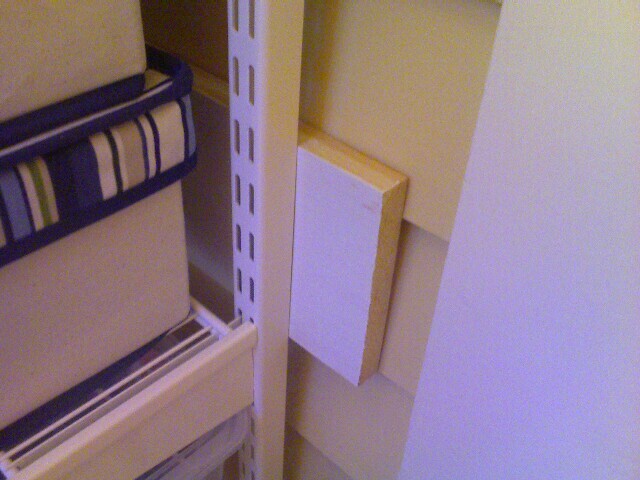 The next day we did the Crafty Cat room (yes our cat is a crafty devil) And now he'll be living with a sewing machine! This was actually a much harder proposition, as we had to do some creative problem-solving. The crafty cat room was at one point a long time ago the outside of the house, so it has outside of the house shingles that are not a flat wall, and elfa relies on a flat wall (or at the very least a standard vertical plane, for you gentle geometrists). And the shingle/clapboards are 6" long and vertical. But Stephanie, who was an architectural student in college, had a great idea-- we bought two 1x6 shelves that were the length of the wall, and screwed them into the shingles. Those 1x6's overlapped the shingles, creating (voila!) a plane that elfa could use. 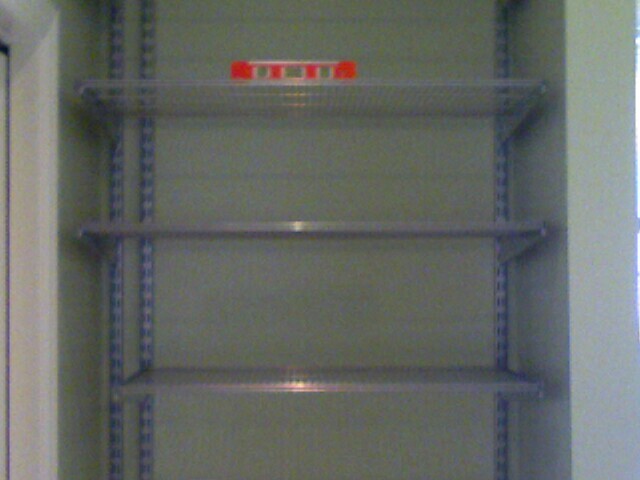 We then screwed the elfa into the 1x6 and the wall, using longer screws, and we had our elfa. And it all worked! It was also hot and sweaty work, because the crafty cat room does not have its own air conditioning duct and because our drill bit sucked (and the screws stripped out a couple of times) But through the sheer brute and animal force of a manly man, I was able to do it. We also had to take down the Metro shelf that was there, which meant emptying all of our stuff onto the floor of the other room (former office, soon to be baby's room) And now MOST of the stuff is up, although somethings have been displaced by the vast amounts of aforementioned radioactive yarn that we have been amassing. The Metro shelf went into the garage where one day it will be set up again, once it has been properly decontaminated of its knitting stature, and it has earned the glorious right to become a clown shelf again. Watch out Pakistan. We are now a nuclear knitting power. The Yarn of Nuclear proliferation. 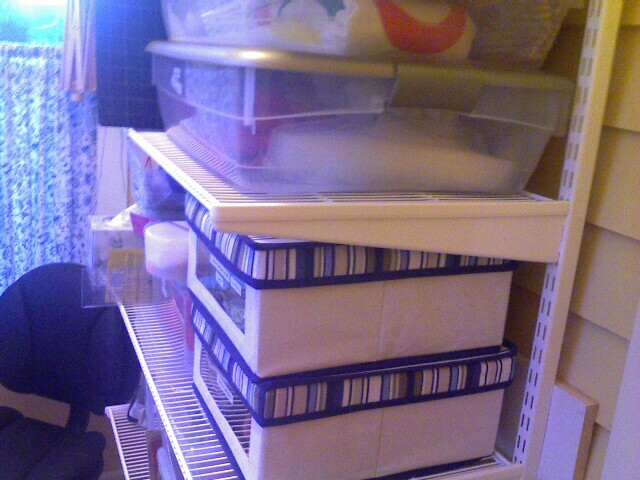 Some more of the everpresent stockpiles. 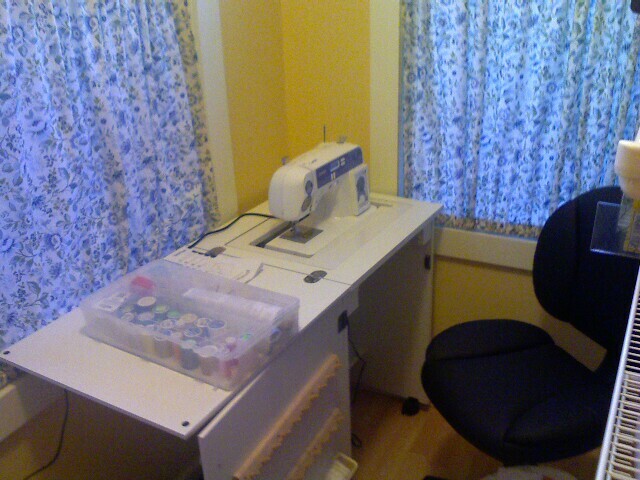 The sewing machine table that I lovingly (and with great amount of curses) put together back in May or June. 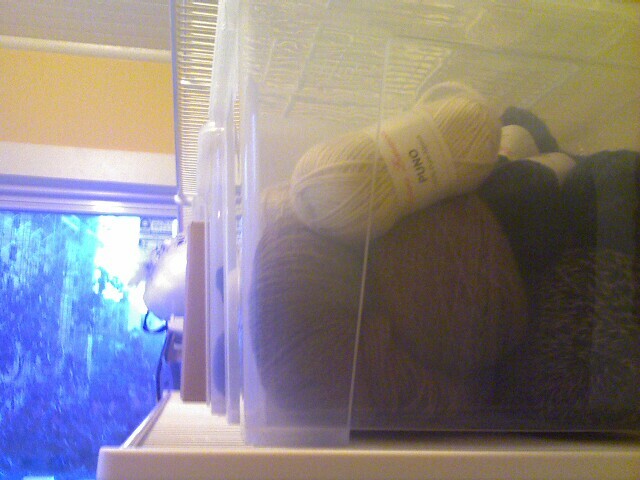 Comments on "Elfa-sizing and the Nuclear Knitting Proliferation Treaty"
drool, swoon, the craft/sewing room looks GRAND! I'm a BIG fan of "teh elfa" - my closet is proof!